Carolina where I was the Director of Reading for Alamance County Schools. I have been the Director of Elementary Education at Wake Forest University in Winston Salem, North Carolina since 1980 and have worked with numerous teachers to develop hands-on engaging ways to teach phonics and spelling. 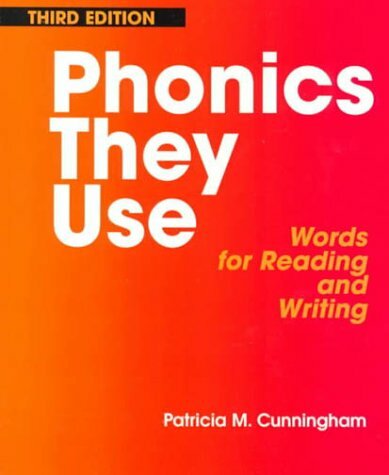 In 1991, I publishedPhonics they Use: Words for Reading and Writing, which is currently available in its fourth edition. Along with Richard Allington, I publishedClassrooms that WorkandSchools that Work. nbsp; Dottie Hall and I have worked together on many projects. In 1989, we began developing the Four Blocks Framework, a comprehensive approach to literacy which is used in many schools in the United States and Canada. Dottie Hall and I havenbsp; worked together to produce many books, including the first Making Words books and the Month by Month Phonics Books. These Making Words by Grade Level books are in response to requests by teachers across the years to have making words lessons with a scope and sequence tailored to their grade level. We hope you and your students will enjoy these making words lessons and we would love to hear your comments and suggestions. nbsp; Dorothy P. Hall I always wanted to teach young children too! After graduating from Worcester State College in Massachusetts I taught first and second grade. After two years, I moved to North Carolina where I continued teaching in the primary grades. Many children I worked with struggled to learn to read in the newly integrated schools. I wanted to learn more and received my M ED and Ed D in Reading from the University of North Carolina at Greensboro. nbsp; I also worked at Wake Forest University where I met and began to work with Pat Cunningham. After three years teaching at the college level I returned to the public schools and taught third and fourth grade as well being a reading and curriculumnbsp; coordinator for my school district. At this time Pat Cunningham and I began to collaborate on a number of projects. In 1989, we developed the Four Blocks Framework, a comprehensive approach to literacy in grades one, two, and three which we later expanded to kindergarten, calling it Building Blocks, and the upper grades, calling it Big Blocks. By 1999 Pat and I had written four Making Words books, a series of Month by Month Phonics Books, and The Teacherrsquo;s Guided to Four Blocks and I retired from the school system to devote more time to consulting and writing. I also went back to work at Wake Forest University where I taught courses in Reading, Childrenrsquo;s Literature, and Language Arts Instruction for elementary education students. I am now Director of the Four Blocks Center at Wake Forest University and enjoy working with teachers and administrators around the country presenting workshops on Four Blocks, Building Blocks, Guided Reading Strategies, and Phonics Instruction. I have also written several books with teachers. One request Pat and I have had for a number of years is to revise the Making Words by grade level and include a scope and sequence for the phonics instructionnbsp;taught. Here it isndash;Enjoy!